Why do so many people not have the glasses they need? The obstacles to providing glasses to two billion people who need them: say ‘AAAAA’! All of the following are required for a person to get the glasses they need: on the demand side, awareness of the need for glasses, the acceptability of wearing them, and their affordability; on the supply side, access to the product and the means to ensure the accuracy of correction. The failure of any one of these aspects will prevent people from getting the glasses they need. Someone with refractive error needs the basic awareness that the blurriness of distant objects is not “normal” and that it can probably be corrected with a pair of glasses. Older people who have become presbyopic at least know that they once were able to focus on near objects but now struggle to do so; rather than resigning themselves to this “natural” age-related disability, they need to be aware that with a pair of glasses they could continue to focus up close. A child or adult who has never seen a pair of spectacles or appreciated their purpose will be reliant on someone else in the community being aware of the possibility of blurry vision and how to recognise the symptoms in others. Without some form of simple visual acuity screening, the symptoms of myopia (shortsightedness/nearsightedness) may be misinterpreted: a child may wrongly be judged as less mentally capable in class rather than as simply unable to see clearly what is on the blackboard. Given the awareness of the possibility of correcting refractive error with a pair of glasses, there needs to be a willingness to contemplate actually wearing them. All cultures have strong norms with respect to personal appearance and especially any decorative or functional modification of the face (make-up; jewellery and other worn objects; veils and other clothing). An unworn pair of glasses serves little purpose. I freely admit my own initial reluctance to wear glasses as a teenage student: I would wear them only in class and only while I absolutely had to read something on the blackboard; at all other times, they sat on my desk. In some cultures, wearing glasses may bring negative associations beyond the aesthetic, from concern over functional disability to superstitious beliefs. Recognising the influence of vanity and cultural norms, the acceptability of wearing glasses may be one of the harder obstacles to overcome – and one that may have to be overcome in each culture and community in its own way, precluding any universal approach. If not donated, glasses need to be affordable for the wearer (or in the case of a child, his or her parents). Given the scale of the problem, aid-funded delivery glasses to everyone who needs them is financially unsustainable. Rather, donors must focus on the highest priority groups such as school-aged children. Developing world governments have competing priorities for their health and education budgets and it may be unrealistic to expect them to cover the cost of providing glasses to the whole population in need. A financially scalable approach is a market-based one: people in need buying glasses at a price they can afford. Given awareness of the need for glasses and acceptance of actually having to wear them, and assuming their affordability, the population in need must have access to the product. The challenge is that a conventional pair of glasses is not just a uniform product but rather the end result of a service involving the creation of lenses of the specific powers required by a particular wearer. In the developed world, this service depends on a highly trained (and well equipped) eye care professional to determine a person’s prescription (i.e. the power of lens they require in each eye) and the optical industry infrastructure to deliver a bespoke product in accordance with that prescription. So there is a professional problem and a logistical problem in providing access to glasses. I will say more about the professional problem under Accuracy below. But assuming for a moment that the professional problem has been solved – say we have a magic device to find a person’s prescription – the logistical problem still has to be addressed. The manufacture of spectacle lenses tends to require high precision to achieve optical surfaces of a quality that avoids visible distortions. As I have discussed previously, while a presbyope (i.e. 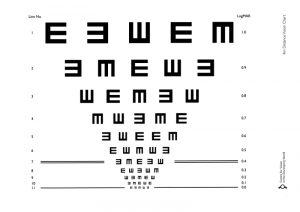 someone who needs reading glasses) can be offered a choice of just two or three convex (positive) powers of lens and typically get a good result, someone who needs concave lenses to be able to see clearly in the distance will need the correct power from a large range of possible negative lens powers. Having selected the correct power of lens for each eye, the lenses must then be fitted into a spectacle frame. Conventionally, where an optician’s shop offers a wide range of frame shapes, the edges of the lenses will have to be cut to fit the frame. Even where lenses are pre-cut to fit a standard frame, someone needs to select the correct lens powers from among the tens or hundreds of possible powers and to assemble them together with frame. This imposes logistical constraints on the location of manufacture of conventional spectacles: there needs to be the space to store an inventory of tens or hundreds of different powers of lens (i.e different stock-keeping units, or “SKUs”); there needs to be a system to monitor this inventory and order replacements when a given SKU is running low, and people trained to manage this system; there needs to be the transportation infrastructure to resupply within a reasonable time. It can be difficult to support such a complex supply chain in many parts of the developing world, especially as one gets farther from major cities. The natural response to a fragile supply chain is to hold more inventory closer to the customer. However, this leads to a financial problem: the capital expenditure required to stock a local distributor of conventional glasses (and to provide the necessary training to manage that inventory as well as all other aspects of delivering glasses) has to be spread over the base of customers served by that distributor; but by definition, getting closer to the population in need – especially in smaller towns and rural areas – means a smaller customer base, driving up the unit cost of delivering the product and reducing affordability. The professional problem is the lack of eye care professionals to serve developing world populations. Some sub-Saharan African countries have ratios of one optometrist per million or more of the population; even if everyone formed an orderly queue and the optometrist worked all day every day, it would take decades to find all the prescriptions (and of course prescriptions can change every year or so, especially in children and young adults). Even where developing world populations are served by eye care professionals, lower professional standards or weaker regulation can mean that the quality of service is less than satisfactory. As part of our clinical trial of the efficacy of self-refraction by myopic teenagers in rural China1, we also measured the accuracy of the conventional glasses they were already wearing: only 30% of the children were able to see with an acuity of 6/7.5 using their own glasses; in comparison, 97% of them were able to see as clearly after self-refracting using our adaptive spectacles. So while this population was aware of the need and had access to affordable glasses, the accuracy of the delivered product was poor. The relative accuracy of self-refraction using adaptive spectacles shows the strength of this alternative approach. Teachers were able to supervise the process of self-refraction by their students after just one hour’s training by non-professional. A train-the-trainer approach based on self-refraction addresses the professional problem. But the self-refraction approach also simplifies access: logistically, it is far easier to deliver a single SKU product than to manage a supply chain with tens or hundreds of SKUs. Self-refraction using affordable, aesthetically appealing adaptive spectacles thus addresses obstacles on both the demand side and the supply side. This is the fourth in a series of articles by Chris Wray on the problem of lack of access to glasses in the developing world. 1. See the paper published in the British Medical Journal in 2011 by Zhang et al., available on our research page. The eye is a system of lenses to focus an image of an object on your retina so it can be processed and interpreted by your brain. Part of this system, the crystalline lens, is flexible; it changes shape under the control of the ciliary muscle, providing additional optical power to focus on near objects. This is called “accommodation”. What can go wrong with the refractive (focusing) properties of this system? When looking at distant objects, the most common problem is myopia (short-sightedness, near-sightedness). The system has too much optical power, typically because the eyeball has grown too long. Since the flexible lens can only add yet more power, the eye cannot – unaided – achieve the reduced power required to focus on distant objects. Squinting can deform the eye into a more round shape and partially improve focus, but it is difficult to keep the facial muscles engaged for a sustained period. So myopes (people who are short-sighted) typically add another lens to the system: an external, concave lens with negative optical power to offset the unwanted positive power. Held in a frame, these lenses make a pair of glasses (spectacles). The eyeball can grow too short as well as too long, giving a system with too little optical power. This is hyperopia (long-sightedness). Fortunately, the crystalline lens can add power, correcting the overall system and bringing distant objects into focus. However, this means that some of the eye’s limited range of accommodation is used up just to focus in the distance, leaving less capacity to focus on near objects (which requires even greater optical power). Accommodation decreases over a lifetime as the crystalline lens becomes stiffer and less responsive to the action of the ciliary muscle. So while younger people tend to be able to offset hyperopia by accommodating, adults will eventually have too little accommodative power. And at every age, hyperopia reduces the ease of focusing on near objects. A different kind of problem when looking at distant objects is astigmatism: non-symmetrical deformation of the eye such that perpendicular planes have different optical powers. So, for instance, looking at a cross, the vertical bar might be sharp whilst the horizontal bar is blurred. Adding an appropriate asymmetric external lens to the system can offset the error. So the prescription for a pair of glasses might include an asymmetrical element of “cylinder” and its radial “axis” in addition to the “spherical” element. However, other than in cases of severe astigmatism, clear vision can be achieved with the “best sphere” lens that offers the optimal compromise in the sharpness of perpendicular planes (see our research). When looking at near objects, the question is whether the eye has enough accommodation – whether the crystalline lens can add enough optical power – to bring the focus near enough. As accommodation decreases over a lifetime, it becomes harder to focus on closer objects. This is presbyopia. Typically, people over 45 years will need reading glasses to provide a boost of positive power. (Myopes wearing glasses for distance correction may simply take them off, leaving the unaided eye with its default near focus.) Eventually, as accommodation continues to decrease, people lose all ability to change their focal distance. At this point, even the boost from reading glasses is not a complete solution because it simply brings the focus to a fixed near distance without providing any of the flexibility to accommodate slightly closer objects. Depth of focus – the range of distances which are all in focus at one time – becomes more important. Lower light levels – requiring a larger pupil and thus reduced depth of focus – can make it difficult to see near objects clearly, even with reading glasses. Some older people use glasses with varifocal lenses, which provide a gradation of increasing power towards the bottom of the lens so that there will be one particular angle at which an object at a given distance is in focus (the downside being that no object is ever in focus across the whole lens, reducing the effective field of vision). positive-power lenses for presbyopia in older adults (and for severe hyperopia in children). The reason for distinguishing these two categories is the different degree of accuracy of lens power required in each case to be able to see clearly. Give presbyopes a choice between +1.5D and +2.5D lenses (the dioptre, D, is a unit of optical power) with the same power lens for left and right eyes and most of them will achieve good near visual acuity (sharpness of vision). That is because they need only an approximate boost of postive power: their residual accommodation allows them to fine tune their focal distance (provided that their corrective lenses err on the side of being too weak rather than too strong; and that they are not so old as to have lost all power of accommodation). In many situations they can also move their head or change the distance at which they hold an object in order to give further control over the sharpness of the image. In contrast, ask myopes or mild hyperopes to choose between -1.5D, -2.5D and -3.5D lenses (again, same power in left and right lenses) and most of them will end up with poor visual acuity. Hence the distinction in the conventional eye care industry between reading glasses sold over the counter to presbyopic customers, who can try on the different lens powers unsupervised and select which pair of glasses works for them; and on the other hand, for myopic customers, the bespoke assembly of a frame with a pair of lenses made in accordance with a prescription generated by a highly trained eye care professional using specialist equipment. Where this really starts to matter is in the developing world where eye care professionals are few and (very) far between: compare the ratio of clinical refractionists to population of about 1:10,000 in most developed countries with a ratio closer to 1:1,000,000 in many developing countries. The conventional over-the-counter model for reading glasses can be adapted for poor, rural customers served by minimally trained local entrepreneurs, for instance. In contrast, the conventional approach to serving myopes cannot get off the ground without the professional and logistical infrastructure of the developed world’s eye care industry. This is the first in a series of articles by Chris Wray on the problem of lack of access to glasses in the developing world.